A few months ago, before Kaiden was born, I decided I wasn’t going to let mom guilt infiltrate my life. Looking back, this was a little silly on my part because I’ve never fully been able to let go of guilt in other parts of my life. My type A/people pleaser personality doesn’t allow me to live completely guilt-free. It’s something I’ve been working on for a while and probably will for the rest of my life. 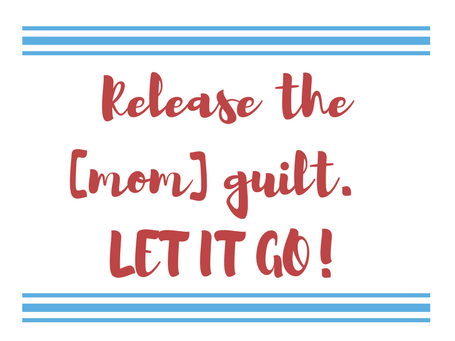 While this post is geared toward my new role as a mama, I think the idea of releasing guilt is one that applies to most everyone. So yeah. I was a little naive a few months ago. I figured I knew and understood how to embrace and/or circumvent the changes, feelings, etc. that were coming. Boy was I wrong. I was certainly spot on about all the positive emotions and changes, but the more challenging ones…not so much. Instead of navigating around them, I ran right into them, especially the feeling of guilt. Well, I’ve realized this whole mom guilt thing is something I’ll continue to face as Kaiden gets older…more so as he gets older I’m guessing. If you’re doing the best you can with the resources you have (time, energy, money, etc. ), release the guilt. LET IT GO! Let it go because all your baby needs is you. And more than that, he/she just needs your love. Everything else takes a backseat. A happy mama equals a happy baby. And isn’t that what we want? When I finally realized how much truth there is to this, I tried that much harder to let go of this newfound mom guilt and embrace this way of thinking. And I continue to do so because let’s face it, I’m a work in progress, and we all know guilt is one emotion that doesn’t disappear overnight! Having my mom here has really helped in more ways than one. It’s just that I have such an independent personality (I can do it myself!) that it was hard in the beginning to accept…the guilt definitely crept in! Let me know when you’re in Chicago next! I could not follow this with my first born but I did implement this with my daughter; every time a negative emotion or guilt overwhelmed me, I made a conscious effort to ask myself, does this really matter in the grand scheme of things? If your answer is no…just let it go! Again this advice may be stupid for a first time mama because we are wired differently but try. Also you are an amazing mum, because these niggling doubts and emotions are signs that you realize what is good and bad for your baby!